Happy Monday! I’m here to share with you an outfit that transitions my summer wardrobe, like these denim shorts, into the Fall season. This sweater would be more appropriate with an olive colored corduroy pant or maybe some black skinnies, but I kind of love it with these dark hued shorts. I went with a simple neutral wedge, and my favorite black bag. Also, if you’re trying to make your transitional look feel more “Fall-like” then add a baseball cap! Any outfit with a cap is instantly chic! Thanks so much for reading! Enter my $500 ASOS giveaway here. Enter to win a free pair of Ryka training tennis shoes here. How cute is this look?! I love everything about it! That sweater is so flattering and your wedges totally complete the entire outfit. Lovely! Your look is so cute!! Such a great casual outfit! I like your shoes and bag very much! I knew I was going to love this outfit when I saw your teaser on insta and I absolutely do! 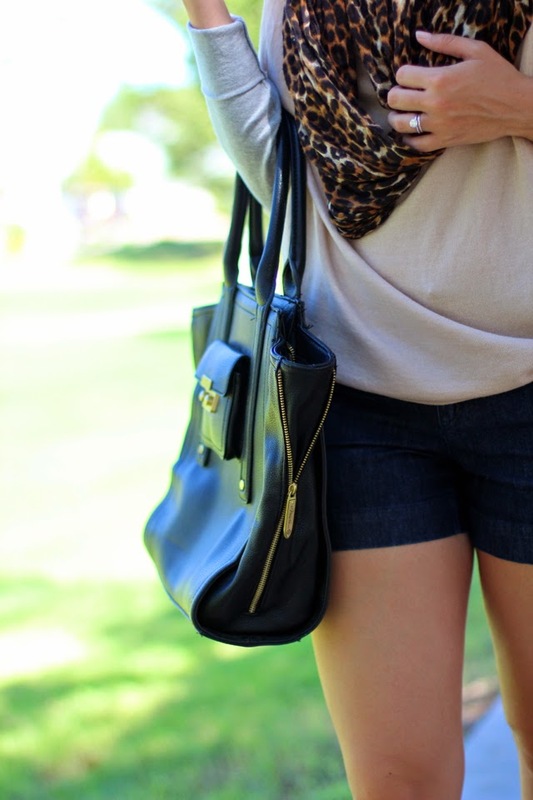 Long sleeves and a scarf are the perfect fall transitions. this is such a fun outfit! loving the mix of colors and patterns. definitely perfect for a fall transition.